At Clarkdale Volkswagen, we’re excited to announce our annual VW Tiguan Clearcut! We made it super easy: One Price = No Hassle. If you’re in the market for a brand new SUV, during this Sale Event you could save thousands of dollars. 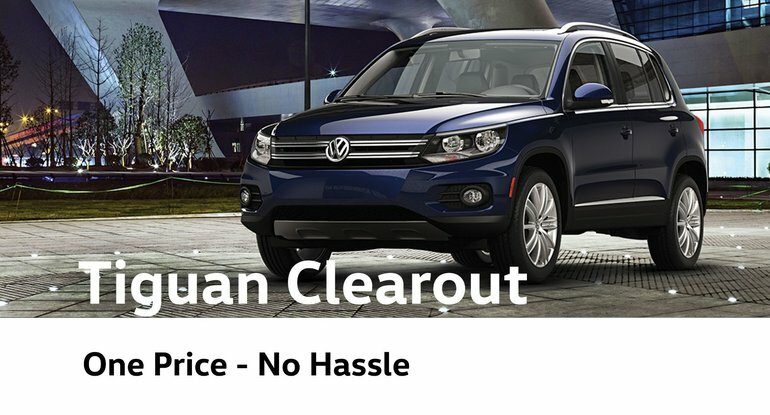 Starting at only $26,987.99 for a brand new Tiguan, our Tiguan Clearout Sale Event sees huge cash savings, low finance rates and special lease cash bonus. And we have over 60 VW Tiguan in stock so we can definitely help you find your perfect VW match. What makes the VW Tiguan special is the way it drives. The VW Tiguan combines the attributes of an SUV – higher ride height and view of the road, greater ground clearance – with attributes of a performance car – flat cornering, responsive handling, 2.0 TSI (GTI) engine. On-road or off-road, in sun, snow or sleet, the Tiguan does it all, wherever, whenever. It’s the perfect car for the Lower Mainland lifestyle. The other thing about the Tiguan is that it looks awesome. Look at those LED headlights! They look even better than on the Passat. And the R-Line front bumper is perfect if you want to stand out. It’s right up there with the Range Rover Evoque, in our opinion. Where the name “Tiguan” comes from? The Tiguan is VW’s compact crossover SUV, so the name Tiguan is a cross between two other words. VW organized a naming contest for the then concept vehicle that garnered over 350,000 responses. The winning name was a cross between the German words tiger and leguan, in English: tiger and iguana. This may seem like a strange combination of animals, but remember, it is a crossover vehicle: mix power with adaptability, performance with playfulness, and safety with daring.